Olie V. Hanshew1 [Ollie V. Hanshew2,3, Olive V. Hanshew2, Allie V. Hanshew2,4, Alice E. Hanshew2]. 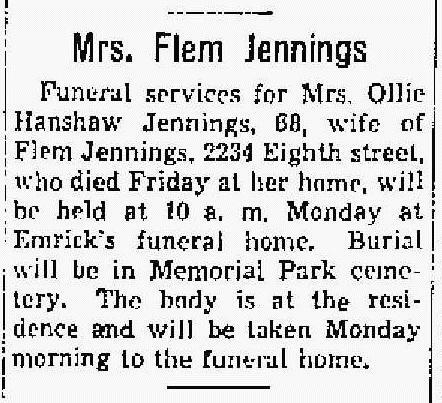 Jennings, Flem M, head-of-household, age 32, born Dec 1867 in Virginia; parents born in Virginia; married 11 years; occupation: locomotive fireman; rented home. Jennings, Ollive, wife, age 26, born Nov 1873 in Virginia; parents born in Virginia; married 11 years; no children. Hanshew, Rosie M, niece, age 11, born Aug 1888 in Virginia; parents born in Virginia; attended school 2 months. Jennings, Fleming M, head-of-household, age 50, born in Virginia; parents born in Virginia; owned home (mortgaged); occupation: engineer, railroad. Jennings, Ollie, wife, age 47, born in Virginia; parents born in Virginia. Henshaw, Anderson, nephew, age 10, born in Ohio; parents born in Virginia; attended school. Henshaw, Charles, father-in-law, age 74, born in Virginia; parents born in Virginia; married. [.. plus six lodgers ..]. Jennings, Flem M., head-of-household, age 59, born in Virginia; parents born in Virginia; first married at age 24; owned home ($8,000 value); no radio in home; occupation: engineer, steam railroad; not a war veteran. Jennings, Allie V., wife, age 55, born in Virginia; parents born in Virginia; first married at age 14. Jennings, Flem M, head-of-household, age 66, born in Ohio; completed 5th grade; on Apr 1 1935 was living in the same house; rented home ($21/month rent); occupation: engineer, N&W Railroad; worked 52 weeks in 1939; $2500 wages in 1939. Jennings, Ollie V, wife, age 72, born in Virginia; completed 5th grade; on Apr 1 1935 was living in the same house. Hanshaw, Charles E, nephew, age 12, born in Ohio; completed 7th grade; on Apr 1 1935 was living in the same house; attended school. Ollie's obituary was published in the "Portsmouth Daily Times" (Portsmouth, Ohio) on Saturday, August 2, 19416 (see scan below). 1920 census, 4th Ward, Portsmouth, Scioto County, Ohio; roll T625-1433, ED 154, page 7A, line #26, dwelling #136, family #160. 1930 census, 4th Ward, Portsmouth, Scioto County, Ohio; roll T626-1868, ED 38, page 9A, line #10, dwelling #211, family #225. 1900 census, Kenova, Ceredo District, Wayne County, West Virginia; roll T623-1774, ED 110, page 19B, line #69, dwelling #354, family #354. 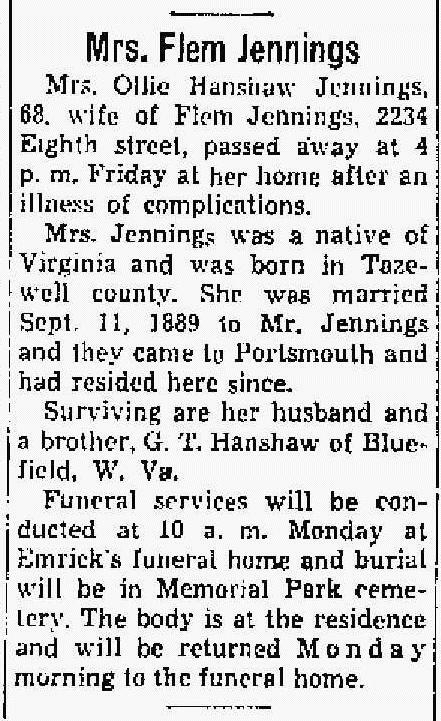 "Portsmouth Daily Times" (Portsmouth, Ohio), Aug 2 1941; http://www.ancestry.com. 1940 census, 4th Ward, Portsmouth, Scioto County, Ohio; roll T627-3143, ED 73-54, page 2A, line #29, household #26. "Portsmouth Daily Times" (Portsmouth, Ohio), Aug 3 1941; http://www.ancestry.com.